Great value in this 2 in 1 book set! CLEAN EATING will change your life forever! Boost your energy, lose weight, feel satisfied, and gain radiant health! Have you been longing for a way to feel healthier, regain your energy and feel more alive? Have you searched for this through various diet plans, only to find yourself discouraged and feeling worse than before? You are not alone! Fortunately, your quest has brought you here! You are ready to embark on the natural lifestyle of clean eating. Clean eating is simple and intuitive. There are not pages and pages of rules or complicated calculations regarding calorie or nutrition content. This is because neither of these things is necessary with the proper food choices. All that is needed is a respect for wholesome, clean ingredients. With clean eating, you will focus on the purest foods, free of processing and unnecessary additives. You will also learn how to combine the freshest of flavors to bring them to life in new, vibrant dishes. Very soon, you will begin to feel the pulse of life flowing through your veins again! 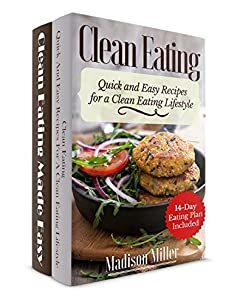 This book has been created to present to you in the simplest form the basic principles of clean eating, an easy-to-follow 14-day menu plan along with all of the delicious recipes that you need to get started on this new lifestyle. You will soon find that clean eating is incredibly simple and easy to make a part of your life, regardless if you fly solo or are head of a large family. Clean eating will accommodate everyone. Feeling sluggish? Tired all the time with low energy level? Feeling hungry all the time? Adopting a clean eating lifestyle might just be what you and your body need. The clean eating program is not so much diet as a new way of thinking about the food we eat. We are spoiled for fast food choices and so the types of foods we eat can depend heavily on where we are at meal times or what is easiest to grab on the go. What weâ€™re missing is the understanding that all food is not created equal, and filling up your body is not the same as fueling your body with nutrients it can use â€” and that will protect it from illness. The clean eating approach is about only ingesting foods that are going to provide your body with benefits. You are going to eliminate all processed goods, foods high in bad fats as well as foods that are laden with sugars. What you are left with are clean foods that your body knows how to break down and utilize for optimal body functioning. Clean Eating Made Easy includes delicious, wholesome recipes for breakfast, lunch, and dinner. â€¢You can start off your day with Avocado-loved Eggs or Strawberry Steel Cut Oats or the Avocado-loved Eggs. â€¢Moving into the lunch hour, a nice dish of Parmesan Broccoli Quinoa is extremely satisfying, or go for a little berry and nuts with Blueberry Walnut Chicken Salad. â€¢For dinner, check out delicious Baked Turkey Meatballs or succulent Garlic Pork Chops. Read on your favorite devices such as Kindle, IPhone, IPad, Android cellular phone, tablet, laptop, or computer with Amazon's free reading Kindle App.